I’m glad you found your way here without too much trouble. 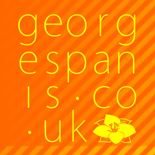 And as if you didn’t know – you’re currently at the online portfolio of my good self, Georges Panis. I’m an interactive developer, designer and illustrator based in Brighton in the UK. For the last ten years I’ve been creating a wide range of interactions including e-learning courses, websites, games, simulations, digital marketing and applications. I’ve had the privilege of working on interesting projects for some great clients and brands. My work has ranged from kids and teens with Nickelodeon, MTV, Disney, and CBBC through to the grown up world of The International Olympic Committee, National Grid, CNN and McCann Erickson. Here you can browse around some examples of my work, or get in touch when you need a time-stealing game, some e-learning, or an illustration or two. And yes – I’m the fella in the picture driving a tiny car. Or at least I was many years ago, when I was small enough to fit in such things.